One of the best things about fall is apples getting ripe on the trees. Surprisingly I don’t love very many apple desserts, but fresh apple juice, and fresh cider are one of my favorite things. If you follow me on instagram (username: aspensmama) you know that a couple weeks ago we made homemade apple cider. We kept it cold. And it was actually really easy, we just juiced some apples, and added a little lemon juice, cinnamon and allspice. Also, it was delicious. Well, along with apple drinks I actually love applesauce as well. I don’t like it chunky, and I like it a little bit sweet. So here’s my version of homemade apple sauce. PS. HAPPY HALLOWEEN! Are you going to dress up today? Nate and I work together and our work has a Halloween luncheon. Last year we won best couple when we dressed up with Nate as an overstuffed suitcase and me as a tourist. This year we are going with Nate as a fly fisherman and me as a fly. Hope we win again! 1. Wash and peel your apples. Cut each apple into 8 pieces. Remove the seeds and stems. 2. Put your apples and all ingredients into a large pot. Stir together a little. 3. Put pot on your stove over medium heat. Cover pot with a lid. 4. Allow apples to cook for 20 to 25 minutes until soft. 5. If you like chunky applesauce, mash apples with a potato masher until they are the consistency you like. If you like smooth applesauce (like I do), put apples in a blender or foodprocessor and pulse until smooth. 6. 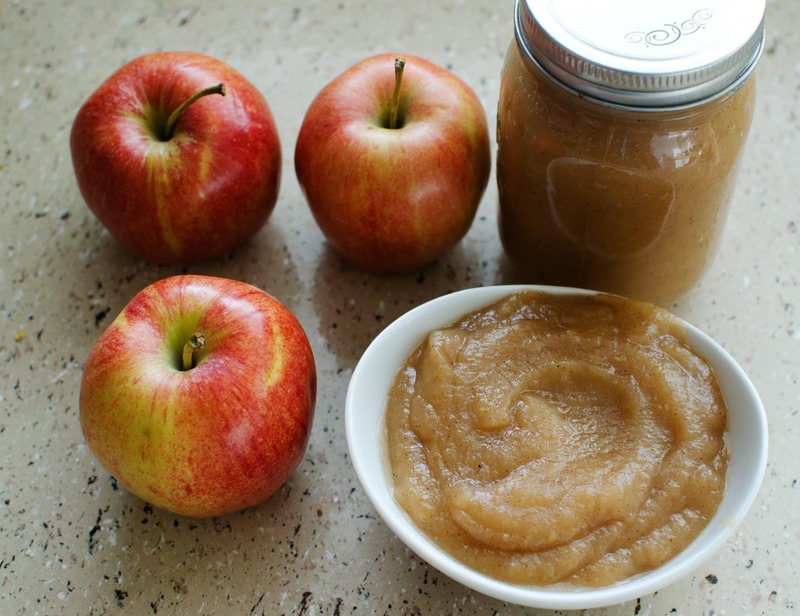 Store apple sauce in a jar in your fridge for up to 1 week.